Sam Houston State University Online will engage professors in topics related to distance education during its fourth annual Teaching and Learning Conference, March 26-27 in the Lowman Student Center. The conference will comprise more than 35 breakout sessions and roundtable discussions about utilizing tools, best practices, and emerging technologies in online teaching and learning. In response to the success of last year’s conference—which drew more than 150 educators from across the state—this year’s event has been extended to two days, promising even more opportunities for attendees to enhance their knowledge about teaching in the online environment, learn new skills, and network with others, according to Bill Angrove, associate vice president for distance learning. 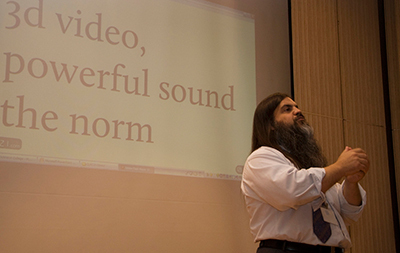 "Since SHSU Online's first priority is to support the university's faculty in providing an outstanding distance learning experience for SHSU students, we are proud to offer the faculty and staff a broad selection of presentations at this year's Teaching and Learning Conference,” Angrove said. “We look forward to welcoming our distinguished keynote presenter, Dr. Bryan Alexander, and interested faculty and staff members from SHSU and across the Texas State University System." Embracing the incredibly rich tradition of the university, the conference’s theme, “Building Our Future on the Legacy of the Past,” will be on full display at the conference’s opening-night reception. Each SHSU college will feature an exhibit displaying its history, ranging from vintage photographs, interesting artifacts, and other notable items. The exhibits will also spotlight current faculty from each college who are leading the way forward in online education. The conference will be kicked off with a keynote address by Alexander, a dynamic personality with a wealth of experience in the field of how technology transforms education. As a researcher, futurist, speaker, writer, educator, and author Alexander promises to be an insightful and engaging addition to the conference, according to Angrove. Following the keynote, attendees will attend one session, and then reconvene to partake in a complimentary wine and hors d'oeuvres reception. The following morning, the conference will continue with a full day of sessions, breaking for lunch and concluding later in the afternoon with a closing address from Alexander. Afterward, attendees will have an opportunity to win door prizes. Registration is now open and is available through distance.shsu.edu/teaching-and-learning-conference.